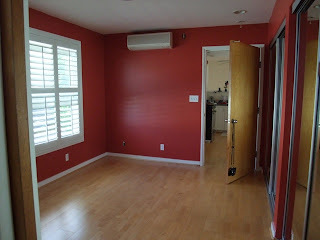 Home / Documentary / Edit Room painted red! I am NOT a Feng Shui expert. But I do think the basic principles of Feng Shui jive with the basic principles of good design, and I used Feng Shui to help design and decorate the last two workspaces, which were both very successful. So Stanford and I read a couple of books, found a few websites and watched a few YouTube videos. They all said the same: in order to be the most successful space for personal growth, creativity and making money, the new World Headquarters of Shirley Thompson Editorial needed FIRE. So we painted the edit room red. Red Ochre, to be precise.